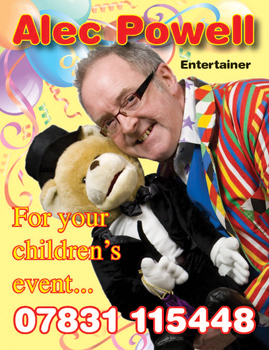 Based in West Bromwich Alec is a professional entertainer of longstanding and has shows that suit all age groups from pre school to teenagers. He has worked for many nurseries and schools in addition to appearing at countless birthday parties. He has appeared as a balloon modeller at numerous corporate events and for local authorities. Enhanced CRB Check and Public Liability Insurance, member of Equity. Alec works not only in the field of children’s entertainment but also performing close up magic for adults or stage and cabaret shows where he has appeared with his comedy magic act. This has included a number of appearances on the Ken Dodd Show. of careful attention to your event..